Everyone who has come within thirty feet of an Atari knows that the machine is capable of great graphics. Everyone who has come closer than that knows how tough it is to get those great graphics. By producing the Atari Graphics Composer, Versa Computing has taken care of the hard work, leaving the user free for creativity and experimentation. This set of utilities performs five main functions; hi-res drawing, medium-res drawing, text writing, geometric figure creation, and player creation. The combination is powerful enough to allow a wide range of graphics. The high-res mode allows drawing with paddles or joystick on a four-color screen with a resolution of 320 by 160. There is one background color, which can be changed at any time, and three foreground colors. While the luminance of the foreground colors can be changed, the color value is predetermined by the background. In this mode, the user can either draw freestyle, or draw lines between any two points. Other options include fill and brush routines. There are two types of brushes: normal brushes fill an area with a solid pattern, the air brush puts a pattern of dots over an area. Combining these, one can color in a picture, then add shading. The fill routine, written in Basic, is not fast, but it is very thorough, filling in most irregular patterns without missing any spots. Another nice feature is the accelerating crosshair. When the joystick is moved to a new position, the crosshair moves slowly at first, then speeds up. This allows for fine control over a small area and less waiting time when crossing the screen. While the quality of any graphics done in this mode depends, obviously, on the user's artistic ability, the capability is there to produce detailed pictures. The medium-res mode provides a screen with 160 by 80 resolution, with one background and three foreground colors. These colors can be changed at any time. (For those unfamiliar with the Atari, a change in color actually changes a color register, thus not only do future lines appear in that new color, but lines drawn previously with that color also change to the new color.) As with the hi-res mode, medium-res also provides a fill routine and a selection of brushes. The text mode places characters from any of four fonts on the hi-res screen. In the disk version of this package, users can switch between any of the modes using hi-res without losing the picture on the screen. Thus a scene can be drawn using the drawing mode, then labeled in the text mode. 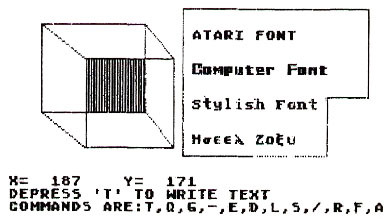 Along with upper and lower case, all special Atari symbols are supported. Also, the program will accept any user-generated fonts, though the documentation doesn't cover the process of font creation. To write on the screen, the user first positions the cursor at the desired starting point, using joystick or paddles, then types "T" for text. From that point until the escape key is pressed, all typed characters will be displayed on the screen. Editing keys such as delete still perform their usual function. If the user has switched to lower case, the program won't recognize any commands, but it will prompt the user to press the SHIFT and ALL CAPS keys. hires mode. Lettering was added in the text mode. The geo-maker mode allows the creation of a variety of geometric figures, from circles and arcs to triangles and parallelograms. Figures are defined by specifying points. A circle, for example, is defined by its center and any edge point. Triangles and parallelograms require three points. The circle and arc take the longest creation time, while other figures appear rapidly. The geomaker includes a routine for Moire patterns. The user specifies the step value and, if desired, a window area, then uses the joystick or paddles to fill an area with the pattern. 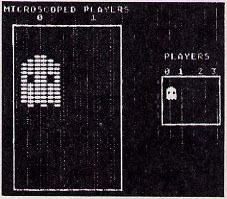 One of the most attractive features of the Atari is the ability to use players in animation. 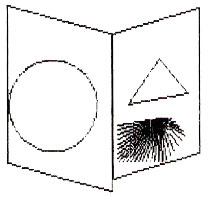 These shapes are usually coded by hand. The Graphics Composer has automated the process. Player creation is potentially the most valuable utility on the disk. It presents the user with a grid for designing players. Each large dot turned on in the grid is also displayed in true size on the screen. Once a player is created, it can be saved, and the decimal values representing the player can he displayed, allowing the user to put that player in his own programs. Beyond explaining all the functions of the programs, the documentation also describes how to use the picture loading routine in other programs, thus making pictures created on this system retrievable by other software. Anyone doing, or planning to do, graphics work on the Atari should seriously consider the Atari Graphics Composer. David Lubar is a former associate editor for Creative Computing magazine.